Even better than described! This item exceeded my expectations and I would definitely recommend this product. This whimsical Sealife 3-piece quilt set from Lush Decor is made from 100-percent cotton and is machine washable. 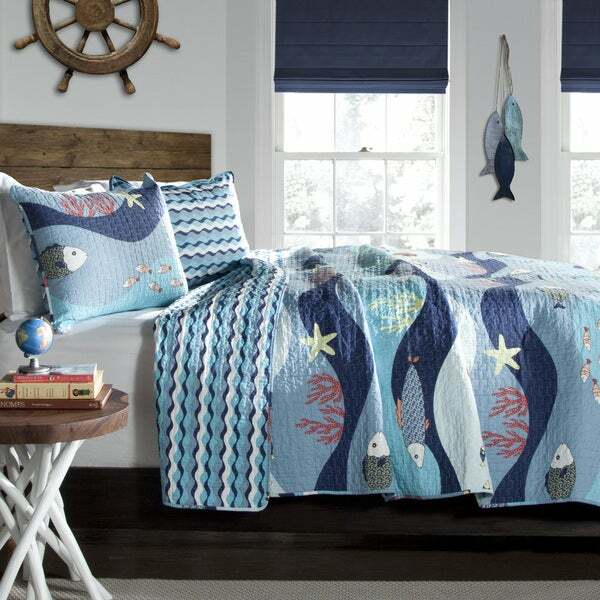 The adorable fish and vibrant coral pattern feature beautiful shades of blue to complement any coastal themed bedroom. Available in twin or full/queen-size and includes matching shams. I love this quilt set. I have a grandson and granddaughter so I looked a long time for a quilt that but would like. It's lightweight so it's perfect for hot summers in Louisiana! And it's so soft that I just love the feel of it. No odors either. It has so many different colors that it virtually matches with any color. I definitely recommend this quilt! This quilt and sham set is promoted as something for kids. However, we are using it on our boat in the main stateroom and it is perfect. Cheerful, not too heavy, well made. Washes like a dream. We love it! Love this set! So colorful and cute. Very nice quality quilt. I got two to put in a guest room on two blue wrought iron twin beds. Love the sealife colors with the blue beds. Would definitely buy again! This quilt is cute, fun, well made, the colors are beautiful and it's perfectly for my older brother's bed, but would also be an amazing look for a child's bedroom, specially if they like fish. Highly recommend this 3 piece set. This quilt looks so much better in person. The colors are so vibrant and the fish are really cool looking. Much nicer than I thought it was going to be. The quilt is light and soft. For the money it is a great value. My daughter is in love with this set and the curtains. We are going to paint her room like an ocean and stencil the fish on the wall. When it's all done I'll post a picture. Great colors, cute pattern, machine washes and dries well, little or no shrinkage on cold water/ low temp dry cycle. Very happy with this quilt set.....I bought 4 for bunk beds. The quality is nice, although a sham had a defective zipper (Overstock reps are great helpers). The one thing you need to know...the photo is deceiving - this is not really just a quilt. It's actually a sleeping bag with a full zipper - to use it as a quilt, you have to completely unzip it, thus the border is now the zipper on 3 sides. The inside is a soft white fleece - very nice. Great for the bunk beds. Nice colors and warm. Can be used as quilt or sleeping bag. Put this in a room with the Nautical Belle Isle quilt and colors match perfectly. Not the highest quality, the pillow sham zipper (yes, it has a zipper) broke the first time I used it, but thanks to Overstock, I got a replacement immediately. The quilt is pretty lightweight, but perfect for our warm weather Southern CA. One of the best reasons to buy through Overstock is their Excellent Customer Service. If you have any problems, they are always at the ready to make things right! 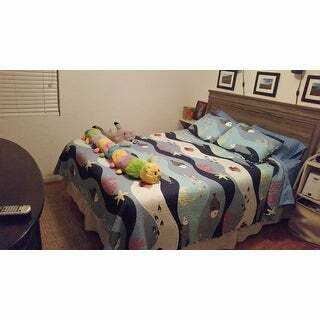 Paired this easy care, fun, quilt with Hotel Coastal Microfiber Print sheet set for our houseboat bedrooms. Pretty, comfortable and easy to wash and dry. This quilt is adorable. The colors are as shown in the pictures and the quality of the material is as expected. It is the perfect quilt for our cabin. Such an Awesome and eye catching set. Ordered the starfish rug to go with it…looks as though they were made for each other! Just love the colors!! It’s a wonderful pattern for my son’s room! It’s a nice weight quilt but after about 5 washes it is starting to fade. Absolutely adorable, washable, and the reversibility makes it super fun for our beach house- can flip for kids, teens or adults! Update: I washed this coverlet in the washer and dryer and it looked fantastic! it faded just a teeny bit, and puckered up a little, but looked wonderful....just a little comfy worn in, not terrible! Love the pattern and the quality is decent. Was worth the price and looks great in my son’s room. "I just ordered this and it's the way. The current description does not mention zippers on the quilt and I hope it does not have them. Can you tell me if it does or not?" No zipper on my quilt. "What does the sleeping bag with zipper option mean?" Hello mindyreynolds723, this option lets the quilt function as a sleeping bag, to use it as a quilt you must completely unzip it the sleeping bag which leaves the border of the quilt zipper on 3 sides. I hope that helps clarify, thank you for shopping with us! "One of the reviewers said this is really a sleeping bag that needs to be unzipped, Id this so?" Hello momof4kids, the set includes a quilt and the two shams. I believe it is the pillow cases with the zippers. Thank you for shopping with us. Wanted to personalize our RV. I liked the pattern. And the price was right. Hope I don't have any problems with it in the future. "Is the coral orange or red?" Hello sehblue, the coral is red. We try to represent the colors of our products accurately. Unfortunately, due to the difference in monitor colors we cannot guarantee that the color will match exactly what you see on your screen. Thank you for shopping with us.